A 1911, EAA Witness, or other handgun chambered in .38 Super is an unusual but highly effective choice for concealed carry and self-defense. 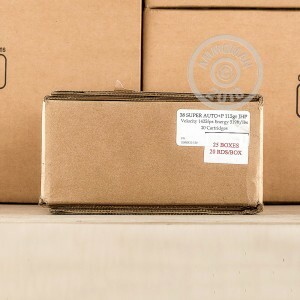 Pair your firearm with this defensive ammo from Corbon for a combination capable of stopping an assailant quickly and decisively. 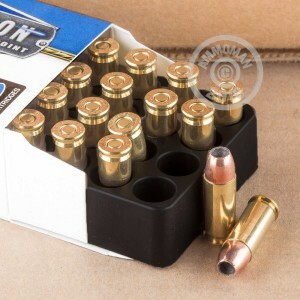 These cartridges come in boxes of 20 and fire a light 115 grain jacketed hollow point bullet similar to those used in 9mm Parabellum rounds. The difference comes in the velocity, which clocks in at 1,425 feet per second at the muzzle. The extra velocity improves the projectile's ability to expand, while the use of a light bullet keeps recoil from getting out of control and reduces the risk of overpenetration. 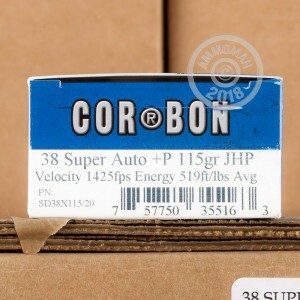 Like other Corbon ammo, these cartridges are loaded in Sturgis, South Dakota using non-corrosive Boxer primers and reloadable brass cases. Note that .38 Super +P is the universal designation for this caliber, so all firearms chambered for .38 Super can fire it safely.